Abraham Lincoln: A fine Example of the Iconic George Clark Ambrotype. Although photographic campaign items did have very limited use in the elections of 1848-1856, it was in 1860 that photographic novelties had a transformative effect on American politics. The most famous example is this Lincoln portrait known as the "Cooper Union" pose. The nation's leading portrait photographer, Mathew Brady, took the image while Lincoln was in New York to give a speech at Cooper Union Institute, in February 1860. 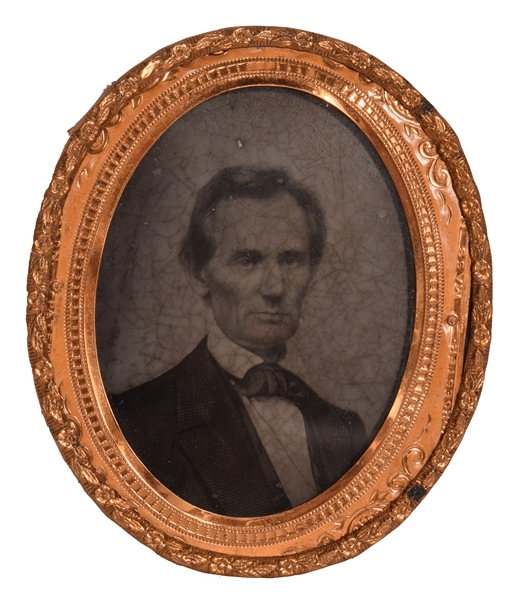 Lincoln was then merely one of many aspirants to the Republican presidential nomination, and the dissemination of this photograph played a major role in his emergence on the national scene. 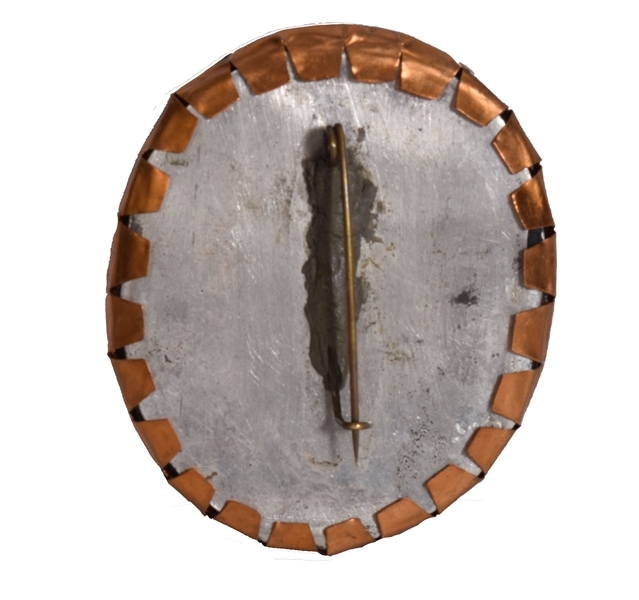 Collectors have long considered this impressive 2.125" x 2.5" brooch to be the premier photographic item from that landmark election. It was produced by Geo. Clark, Jr & Co, Ambrotype Artists in two forms: holed at the top for suspension and with a vertical pin on reverse. This pinback version is generally considered the preferred type, as it inaugurates a long tradition of pinback campaign badges. Condition is often a problem with this item. The photographic emulsion on the underside of the glass was prone to flaking and bubbling, and easily scraped away if unprotected. The thin glass also cracked easily, as seen on many examples. Not surprisingly, the overwhelming majority of surviving examples condition problems, often quite serious. Accordingly, hobbyists have always placed a high premium on examples in good condition. the portrait is ideally centered (centering varies considerably on these, with some distractingly centered to one side or towards the bottom).There are some crackling affect and some very small flaking in a couple spots in the background which are barely visible. But still a nice looking piece of a very desirable Political pin! This same type has sold for up to $35,000.